Last Saturday we went to my friend’s rest house at Laguna. We arrived the rest house almost 11 in the morning. We had lunch at the infamous Burger King. You should see their restrooms. It’s like restrooms in hotel, very classy restroom! I didn’t have the chance to take pictures though. Anyway after our lunch, we went straight to UP Los Baños to stroll and to take some pictures for my blog header. It was raining on our way to UP Los Baños. Gladly it stopped on the middle of our jeepney ride. It took almost 30 minutes including the short traffic. The last time I was in UPLB was during our high school field trip. I just can’t remember where in UP Los Baños. I think it had something to do with preserved butterflies. We started our strolling and picture taking at the UPLB entrance to the UPLB field. 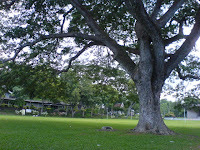 By 4 P.M., we met my friend’s high school friends at the bench near the fertility tree. Go figure why it is called a fertility tree. We had isaw then went to Cribs, a coffee shop near the UP campus. I really had fun that day especially with the company of my friends and new friends. Is the Dao tree still there? Wely, I'm not familiar with the Dao tree. Where is it located by the way? Where is that uprooted tree in the picture located? Could you remember which area? Or near what buildings? The infamous Dao tree that wely might be talking about is the tree in front of the SU building, the SU building is the building, to the left of Palma bridge and just in front of the freedom park (I don't think that was helpful at all, I'm sorry). That Dao tree became *the* Dao tree because the chancellor wanted that tree to be chopped down since hollow na raw ung ilalim and can fall any time, etc. Marami ang umalma since I don't think there ever was a tree chopped down in elbi grounds. And that tree's wood is worth a lot if sold and the money might just secretly go to "someone's" pocket. It was a big issue some 3 years ago. Gak! Waaaa~ na-miss ko naman tuloy ang pinakamamahal kong bundok. Nice pics! Love your pics! Grabeeeeee. :p Sa D.L Umali pa yung header mo! Weeeeee. :P Promote LB! lol.